The disappointing reverse comes as a massive blow to Paul Hinshlewood's side’s U19s Alliance League title ambitions with the three points from a win vital to haul them back into contention for the crown. Blake, No2 to Jack Pearce, was on hand to run the rule over the promising talent with a view to draft in some of the youngsters to the first team picture to boost the ranks following a terrible run of injuries. But despite the home side's best efforts it was an energised Hawks outfit that went away with the spoils. With the opening exchanges pretty even, it was fair to assume the first half would end on a stalemate - especially when the impressive Joe Clarke squandered two chances as the half drew to a close. But Havant striker Max Davies broke the deadlock on 39 minutes when he showed great enterprise to get in front of his markers and cleverly flick the ball past despairing Rocks keeper Olly Howley. 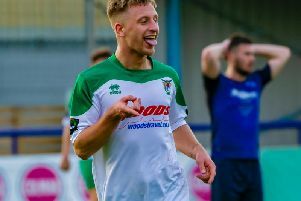 Clarke, who is in the first team set-up at Bognor’s Bostik Premier division rivals Worthing, showed bundles of intent as the second half got under way and was unlucky to see a clever chip dip over the bar — but better was to come. He drew the home side level at 1-1 on 52 minutes when he latched on to a telling through ball from Jamie Carroll and steered his shot past keeper Oliver Eyres. Carroll is a gifted playmaker and has featured in first team squad this season but to do so again he perhaps needs to be prepared to knuckle down and work harder off the ball. 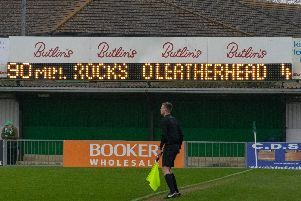 The goal enlivened the Rocks but a decent spell of knocking at the door failed to lead to anything more than frustration, especially for Clarke. He displayed admirable athleticism and a willingness to get behind the visitors' rear guard and on any other day he might have hit a hat-trick. But the spell of pressure didn't yield any advantage and when Marvin Orepo stole in at the far post to poke in a long ball to make it 2-1 the writing was on the wall for the home side. It wasn't as if they lacked endeavour but the guile which they have displayed in abundance throughout this season was elusive and in the final analysis they will rue missed chances which cost them dear. Bognor: Howley, Morris, Hands, Hambleton, Higgins-Pearce, Bain, Kardos (Bennett 70), Henton (Slaughter 75), Humphries, Clarke, Carroll.